In what is turning into a Caribbean soap opera, Venezuela's foreign minister Delcy Rodriguez, with Bolivia's David Choquehuenca, on Wednesday morning turned up at Argentina's foreign ministry pretending to participate in an extraordinary Mercosur council meeting, to which she had not been invited since Venezuela is officially suspended from the group. In the midst of the confusion and the controversy Ms Rodríguez allegedly met with foreign minister Susana Malcorra who said that Argentina, as host country, officially asked her not to attend the meeting of the Mercosur founding members foreign ministers. This according to the twitted version from the Venezuela official who added that if they insist in not allowing me in, we will do so through a window because we are here to defend the rights of Venezuela. She claimed in the social network, The foreign ministers of the Triple Alliance are confabulated against Venezuela and Mercosur denies dialogue with Bolivia and Venezuela. Rodriguez arrived early dawn to Buenos Aires with her Bolivian peer, and at 10:00 turned up at the Argentine ministry where developments were evolving and the founding members ministers were scheduled to hold an extraordinary meeting to formally confirm Argentina as the pro tempore chair of Mercosur for the next six months. Last December first, Venezuela had been suspended of its inherent rights, vote and voice, from Mercosur for not having complied with the incorporation of the group's legislation to which it had been given a previous extension of ninety days. Venezuela called the decision illegal and refused to accept it and apparently implemented the Olivos Protocol which enables member countries to appeal decisions. Bolivia which supports Venezuela, accompanied Ms Rodriguez visit to Buenos Aires by sending its foreign minister Choquehuanca. 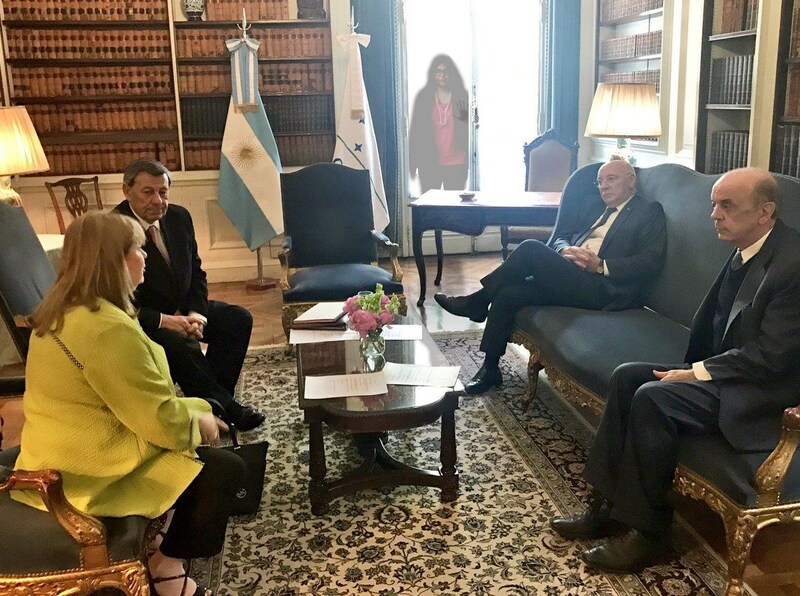 However Brazil's minister Jose Serra twitted a picture of the meeting of Mercosur foreign ministers (without Bolivia and Venezuela) in an office at the Argentine foreign ministry. Paraguay's foreign minister Eladio Loizaga who has acted as spokesperson of the group had anticipated that Venezuela was suspended since 2 December and could not participate or attend the Buenos Aires meeting. Ms Rodriguez is also scheduled to meet with ex president Cristina Fernandez Victory Front and the Motherland foundation that openly support Venezuela. Categories: Politics, Argentina, Mercosur, Venezuela. That answered my question in another thread when I asked if they would turn up like the uninvited party guest.